Really, it’s not toohard to find color this time of year. Though we had one frost a few weeks ago, there are still some fresh autumn flowers, including a couple of asters. 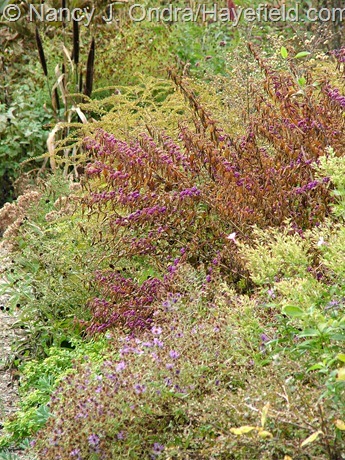 Aromatic aster (Symphyotrichum oblongifolium) self-sows freely here. Though most of the clumps are done flowering now, there are still bits that look nice even this late. 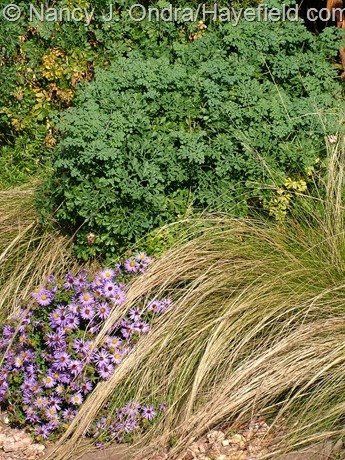 Above, it’s with Mexican feather grass (Stipa tenuissima) and ‘Harlequin’ rue (Ruta graveolens). 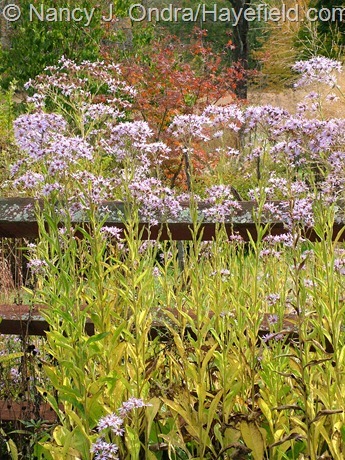 Tatarian aster (Aster tataricus, below) is always dependable for blooms in mid- to late October. I tend to forget that it also develops nice yellow foliage color around this time. And then there’s ‘Sheffield Pink’ chrysanthemum (below), which has a sneaky habit of opening its buds on October 16 – just one day too late to make it into my October Bloom Day posts. It’s worth waiting for, though: the flowers are showy and abundant, and the bees go crazy over them. 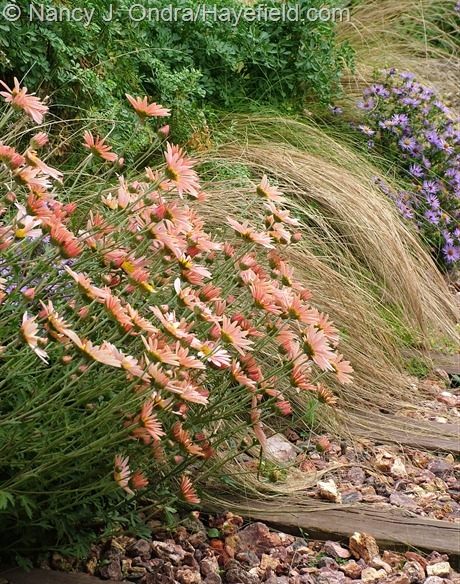 Above is a bit of ‘Sheffield Pink’ with ‘Harlequin’ rue (Ruta graveolens), Mexican feather grass (Stipa tenuissima), and aromatic aster. There’s color now from fruits and seedheads, too. 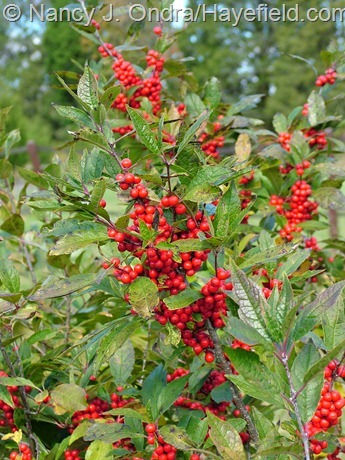 The winterberries (Ilex verticillata) – ‘Winter Gold’ above and ‘Winter Red’ below – have set loads of fruit this year. They’ll look spectacular for a more few weeks …until the deer notice them. 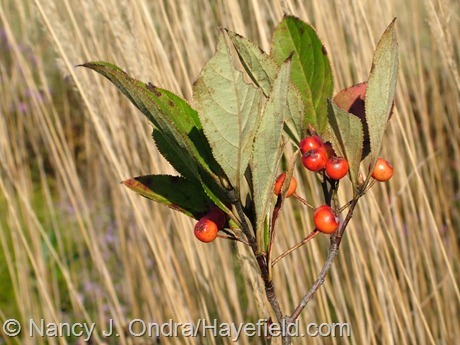 For some reason, red chokeberry (Aronia arbutifolia, a.k.a. 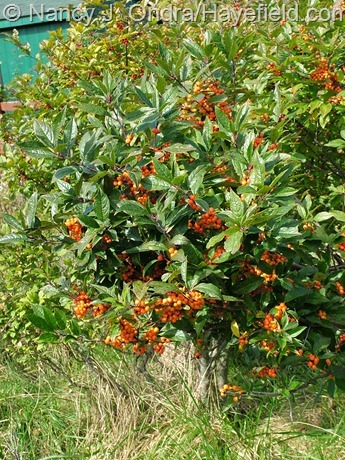 Photinia pyrifolia; below) doesn’t thrive here, but there are usually a few berries on the bits that survive. 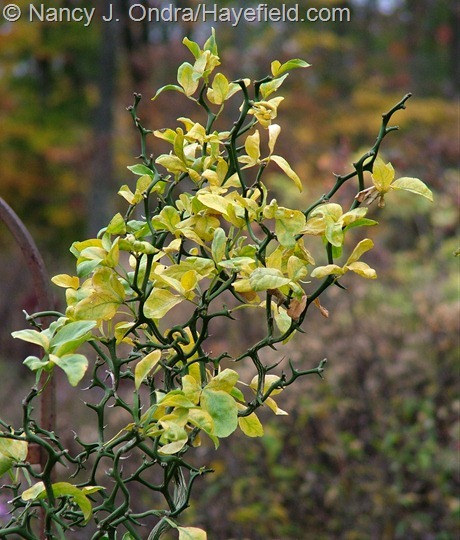 Above, ‘Flying Dragon’ hardy orange (Poncirus trifoliata); below, Chinese quince (Pseudocydonia sinensis). The foliage of ‘Issai’ beautyberry (Callicarpa dichotoma; above and below) got zapped by the frost just as they were starting to color up, but the berries are still putting on a splendid display. 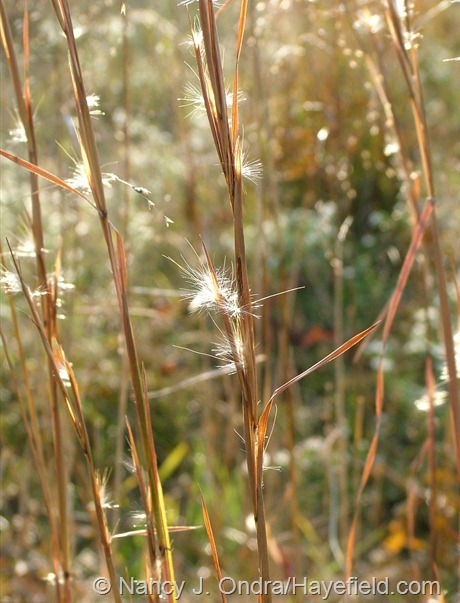 …and below is little bluestem (Schizachyrium scoparium). 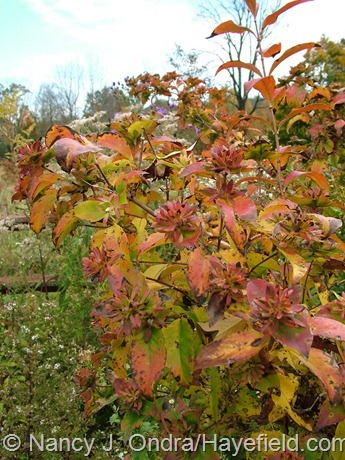 Flowers and fruits are all very well, but what we usually think of as “fall color” is the color from the changing leaves of deciduous trees and shrubs. That’s not one of my strengths, since most of my trees are on the small side and not especially eye-catching – from a distance, anyway. 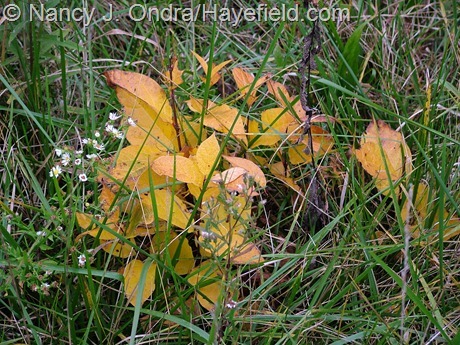 I do find that it’s worth hunting for fall color close to ground level out in the meadow, though, because the colored leaves make it easy to spot nice woody plants. I take a walk out there a few times through October and carry a can of spray paint with me,so I can mark the nicely colored baby trees. That way, I can easily avoid them when I’m mowing the meadow during the winter. Fortunately, the garden has managed to come through for me yet again, this time with some interesting fall foliage colors. 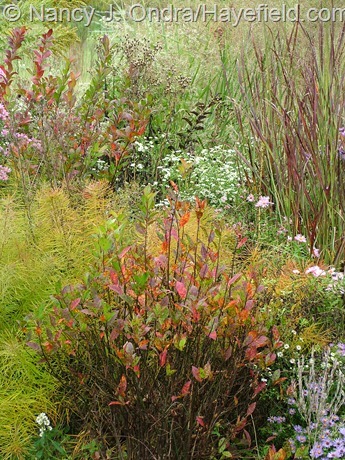 Above, ‘Henry’s Garnet’ Virginia sweetspire (Itea virginica) with Arkansas bluestar (Amsonia hubrichtii), ‘Huron Solstice’ switch grass (Panicum virgatum), and several species of native asters. 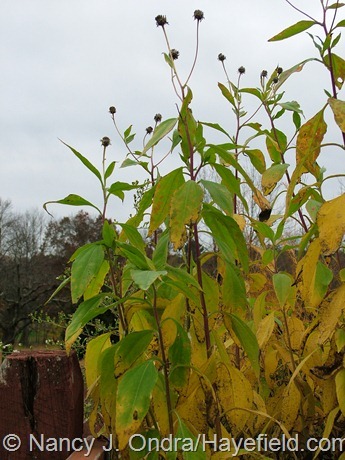 Below, the same ‘Henry’s Garnet’ Virginia sweetspire and Arkansas bluestar with buttonbush (Cephalanthus occidentalis). 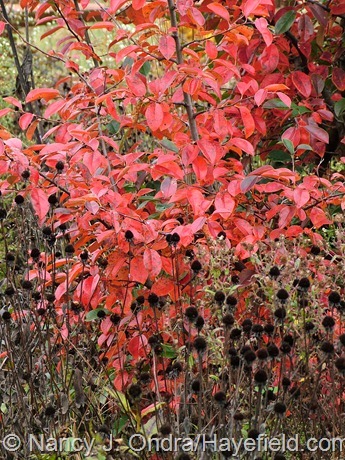 Spireas produce some interesting fall colors, too. 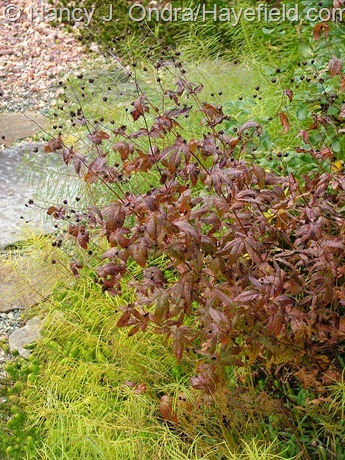 Here’s Dakota Goldcharm (Spiraea japonica ‘Mertyann’): above with ‘Angelina’ sedum (Sedum rupestre) and creeping bramble (Rubus rolfei) and below with ghost bramble (Rubus thibetanus). 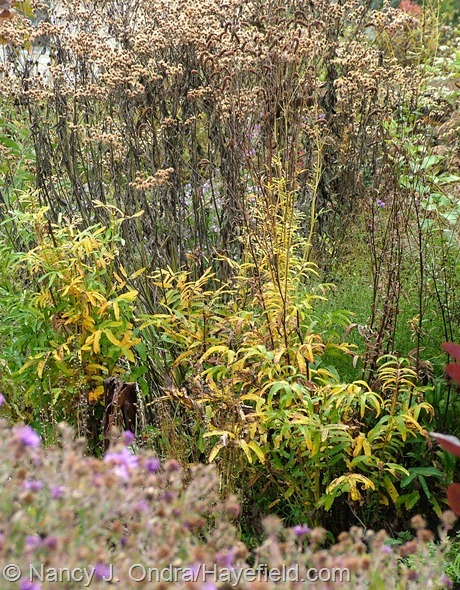 Mellow Yellow spirea (S. thunbergii ‘Ogon’, below) is just now starting to turn orangey at the shoot tips. It’s usually at its best in early November. 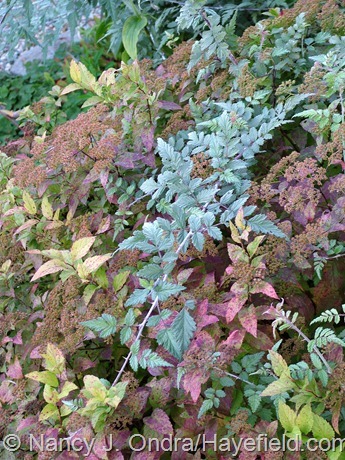 To my mind, the very best spirea – and maybe one of the best deciduous shrubs, period – for rich fall color is ‘Tor’ birchleaf spirea (Spiraea betulifolia, above and below). 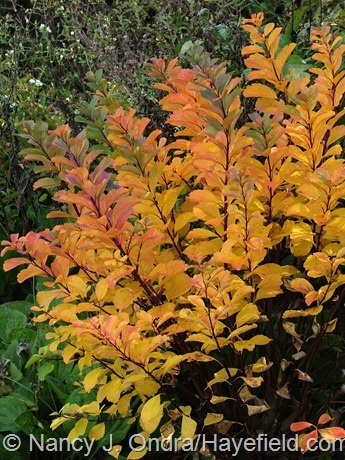 This 2- to 3-foot shrub is hardly noticeable through most of the growing season, but when it turns shades of gold, orange, and purple in fall, you can’t miss it. 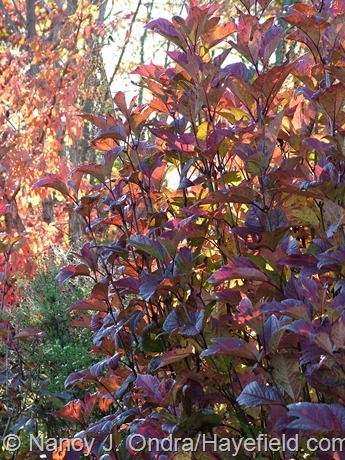 Viburnums, of course, are also fantastic for fall color. 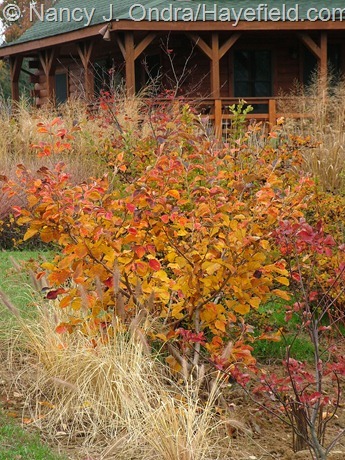 Above is ‘Bailey Compact’ American cranberrybush viburnum (Viburnum opulus var. americanum); below is golden European cranberrybush viburnum (V. opulus ‘Aureum’). 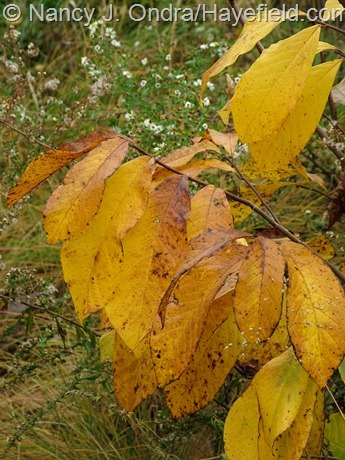 Above, the fall-colored foliage and calyces of fragrant abelia (Abelia mosanensis); below, Japanese emperor oak or daimyo oak (Quercus dentata). Above, ‘Flying Dragon’ hardy orange (Poncirus trifoliata); below, pawpaw (Asimina triloba). 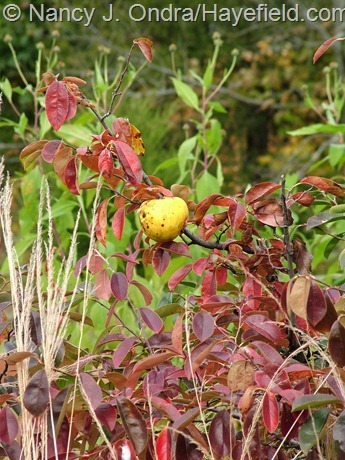 Above, Asian pear (Pyrus pyrifolia); below, Chinese quince (Pseudocydonia sinensis). 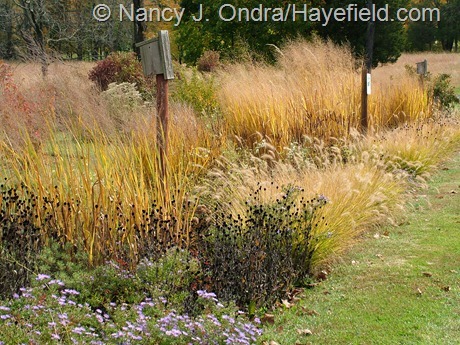 And then there are the grasses, of course! 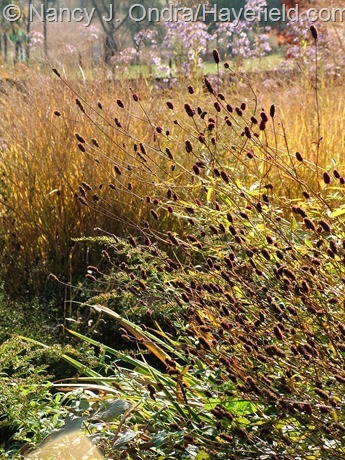 Above is ‘Transparent’ purple moor grass (Molinia caerulea subsp. 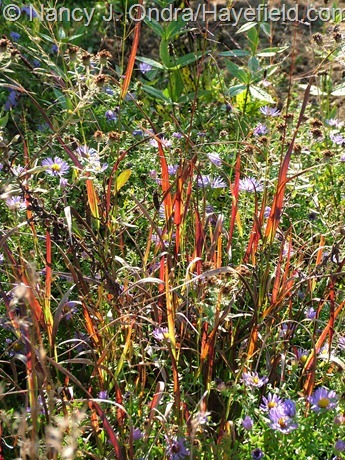 arundinacea) with aromatic aster (Symphyotrichum oblongifolium); below is Japanese blood grass (Imperata cylindrica ‘Rubra’) with ‘Gerald Darby’ iris (Iris x robusta). 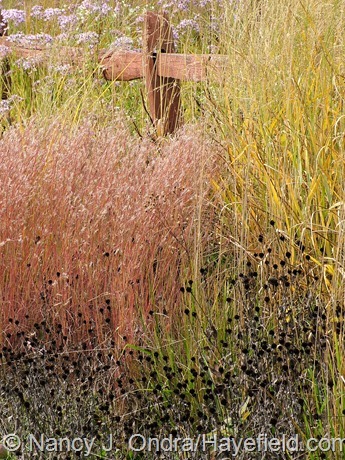 Above, ‘The Blues’ (now more like “The Pink”) little bluestem (Schizachyrium scoparium) with ‘Dewey Blue’ bitter switch grass (Panicum amarum) and the seedheads of orange coneflower (Rudbeckia fulgida var. fulgida). 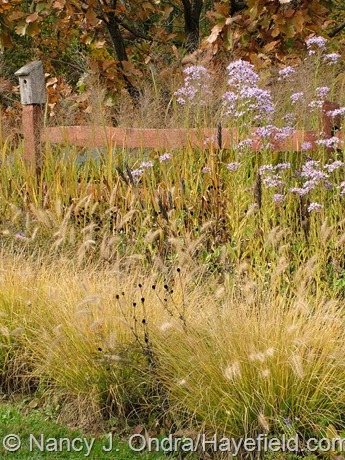 Below, ‘Cassian’ fountain grass (Pennisetum alopecuroides) with Tatarian aster (Aster tataricus). 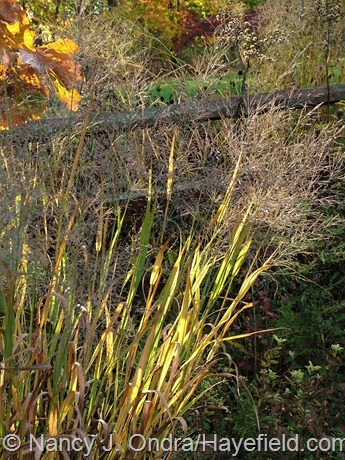 Above, ‘Northwind’ switch grass (Panicum virgatum); below, ‘Dallas Blues’ switch grass. 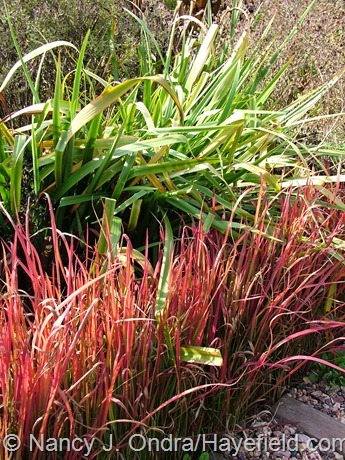 And one more switch grass: ‘Cheyenne Sky’, below. 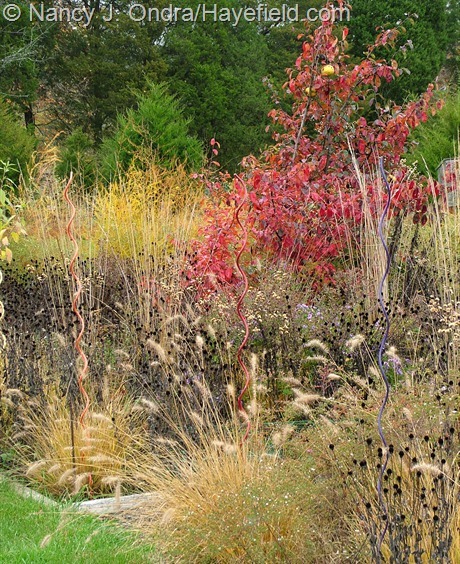 Other perennials don’t get much credit for fall foliage, but some of them make a nice contribution to the seasonal spectacle. Above, the leaves of golden lace (Patrinia scabiosifolia); below, ‘Black Beauty’ Orienpet lily (Lilium). 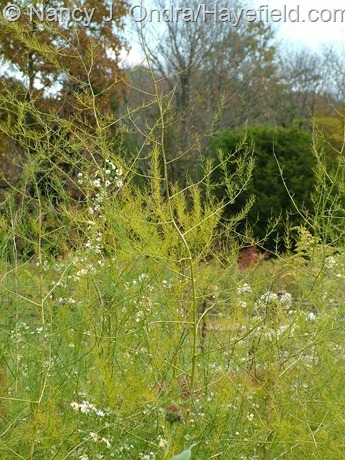 Above, asparagus (Asparagus officinalis); below, Jerusalem artichoke (Helianthus tuberosus). Below, Indian physic (Porteranthus stipulatus). 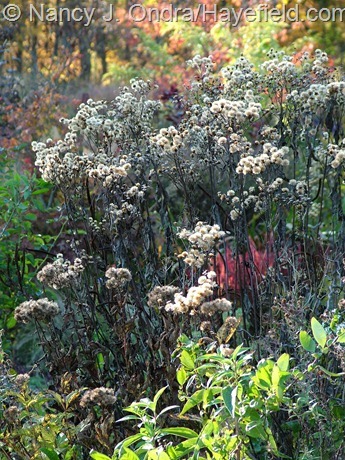 Above, Joe-Pye weed (Eutrochium maculatum); below, Japanese burnet (Sanguisorba tenuifolia). 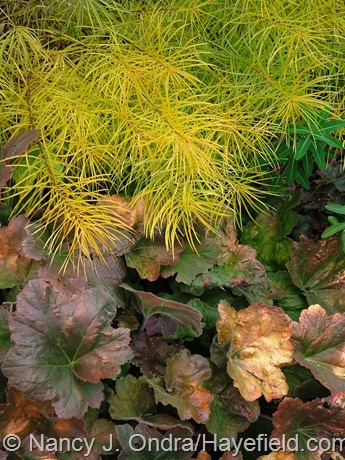 And then there’s one of my top favorites of the fall-colored perennials: Arkansas bluestar (Amsonia hubrichtii), above with ‘Southern Comfort’ heuchera and below in a row along the driveway. Put the fruits and flowers and foliage together, and there are still some very pleasing views of the garden as a whole (or at least there were, before Hurricane Sandy). The next six are shots of the side garden. Below is the “shade border” out back. 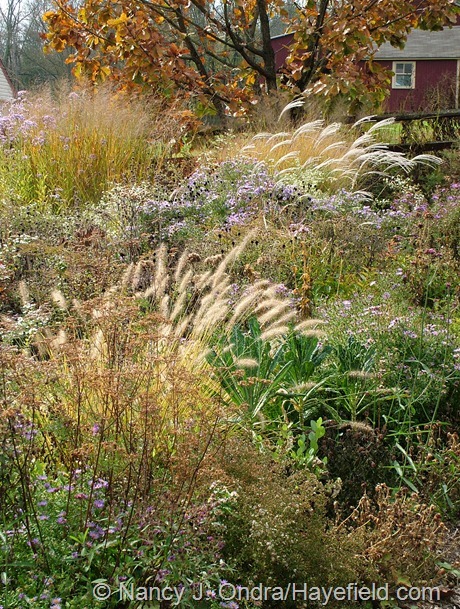 Above and below, the perennial meadow area. Above and below, parts of the Long Border. 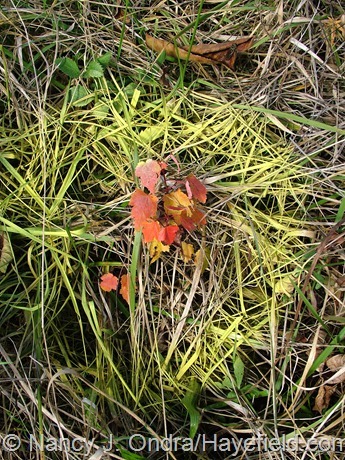 The star above is prairie dropseed (Sporobolus heterolepis); below, ‘Washington Park’ witch hazel (Hamamelis vernalis). 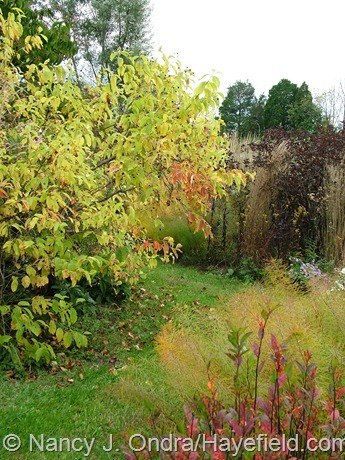 Above, yellow ‘Hummingbird’ summersweet (Clethra alnifolia), reddish arrowwood viburnum (Viburnum dentatum), and orangey fragrant sumac (Rhus aromatica) with a couple of switch grasses (Panicum virgatum). 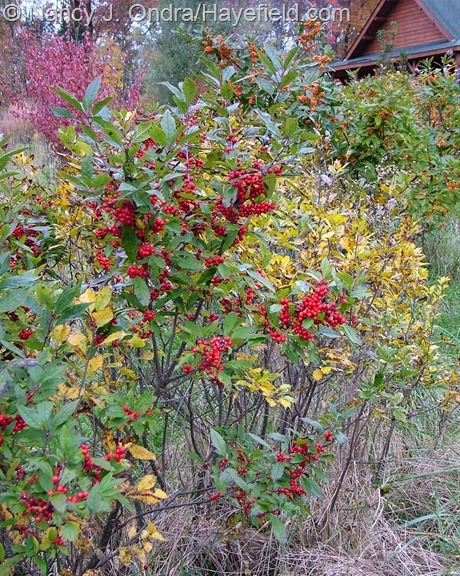 Below, several seedlings and cultivars of winterberry (Ilex verticillata). 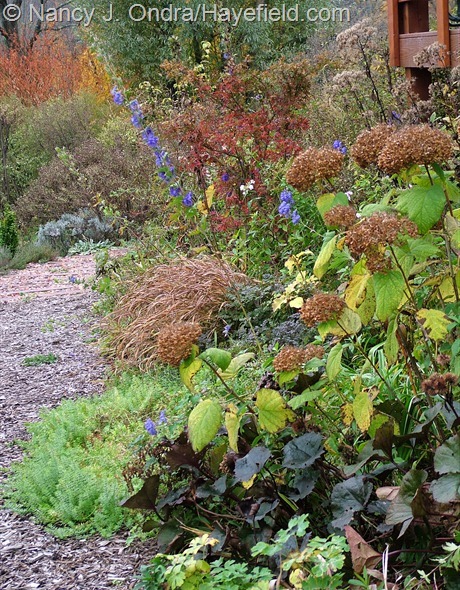 Above, three-flowered maple (Acer triflorum), aromatic aster (Symphyotrichum oblongifolium), and Arkansas bluestar (Amsonia hubrichtii) along the driveway. 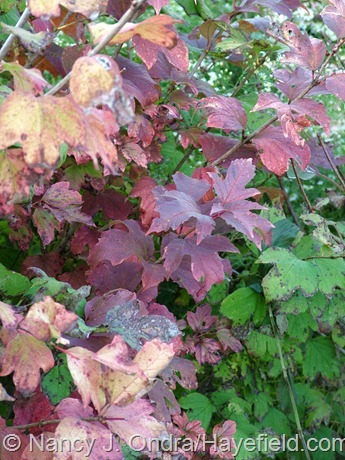 Below, starting at the left, ‘Bailey Compact’ American cranberrybush viburnum (Viburnum opulus var. 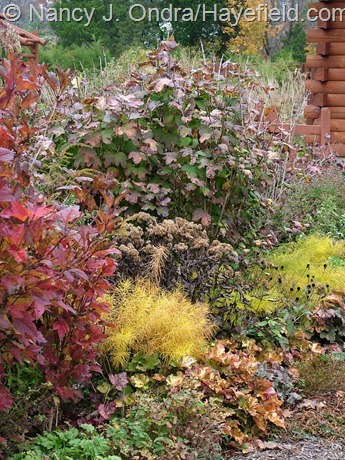 trilobum), golden European cranberrybush viburnum (V. opulus), Joe-Pye weed (Eutrochium maculatum), Arkansas bluestar (Amsonia hubrichtii), and ‘Caramel’ heuchera (Heuchera villosa). 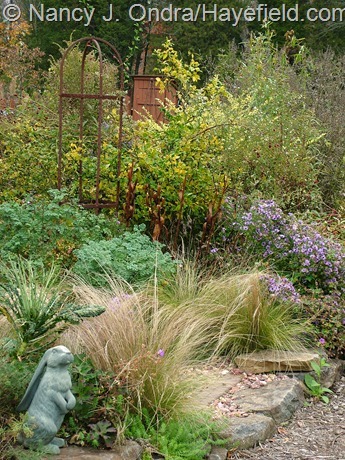 And below, another part of the front garden, with an unnamed Japanese maple (Acer palmatum), Mexican feather grass (Stipa tenuissima), seersucker sedge (Carex plantaginea), Japanese blood grass (Imperata cylindrica ‘Rubra’), ‘Gerald Darby’ iris (Iris x robusta), and – in the background – golden elderberry (Sambucus nigra ‘Aurea’) and three-flowered maple (Acer triflorum). So, I guess I didn’t need to worry about getting enough outdoor shots to fill this year’s fall color post after all. But since I’d already come up with a back-up plan, I’ll toss in the results of Plan B: some scans of leaves that I picked up around here and at my parents’ farm across the road. 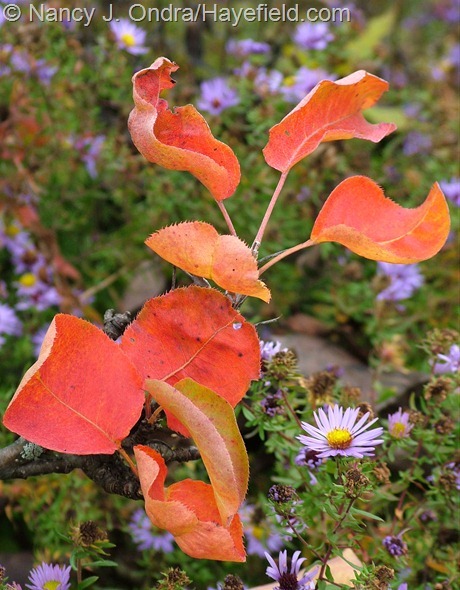 Want to take a virtual tour of fall colors in other areas? 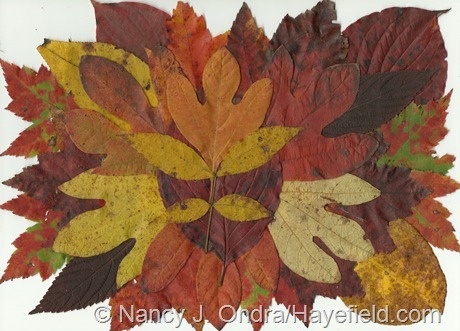 Check out the other participants in this year’s Fall Color Project! 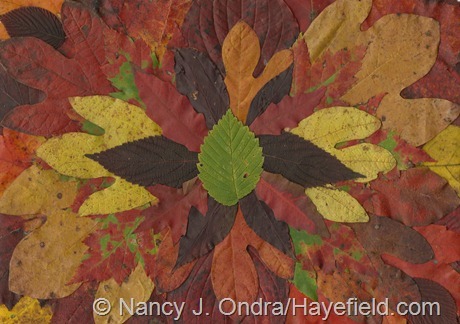 Nan, loved your post and the colorful fall leaves are a knockout! Thank you, Sandi. Things have changed drastically here over the last few days, but the color was nice while it lasted. 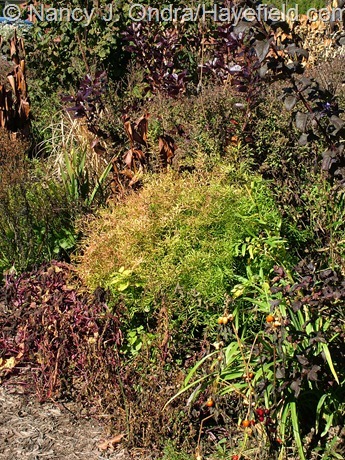 Nan, Your fall garden is wonderful.. such a variety of color and texture. I absolutely adore that Sheffield Pink mum! 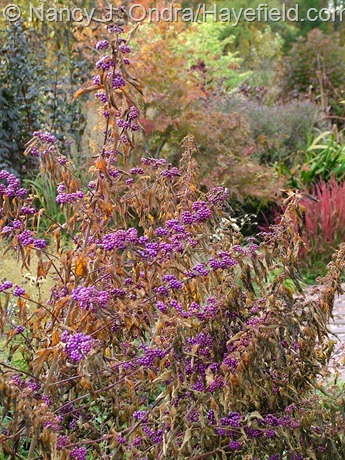 The hot dry summer took its toll on fall foliage here as well, but fortunately, the gardens are still lovely. Of course, that was before the Hurricane took most of the rose petals and leaves down. I hope you fared well in the storm.. I know that you were right in its path. PS…. 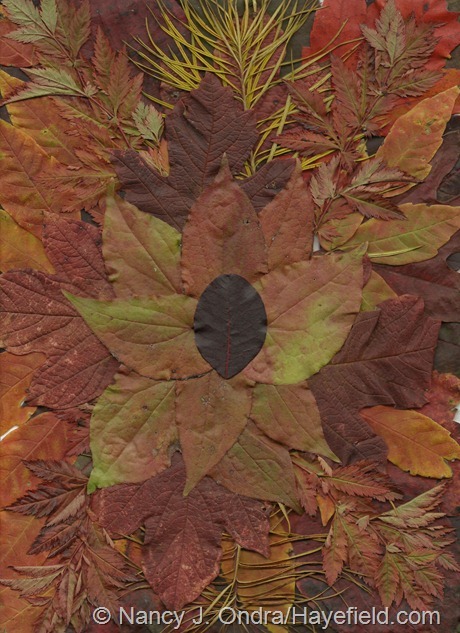 I LOVE your leaf collages! Hey there, Cathy! All of your comments came through just fine (and thank you for them); the problem was my fault. I thought I was being clever by finishing my post before the storm and scheduling it to go up automatically on Wednesday morning. I did not imagine that we’d be without utilities from Monday until Thursday evening! Other than being cold, hungry, thirsty, and in dire need of a shower, we’re all basically okay – a lot better than many people in the region. Just amazing! 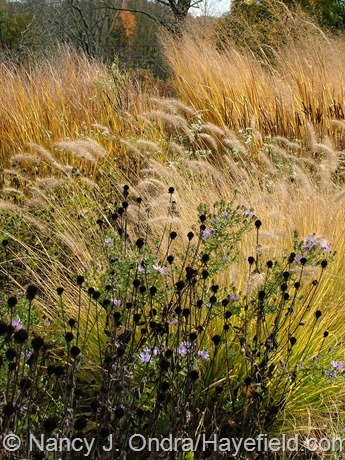 My favorites are the grasses. 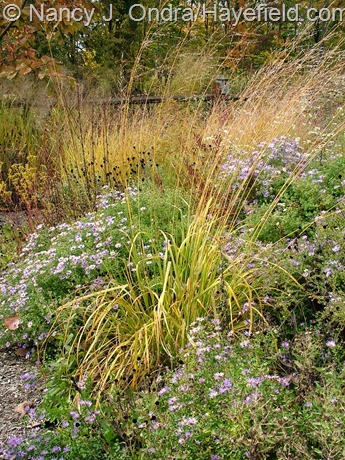 Little Bluestem is such a delight, but ‘Northwinds’ switchgrass looks amazingly upright. I’ll have to give that one a try, as ‘Heavy Metal’ flops a bit for me. Every image is beautiful, but I think my favorite shot is the one near the end that has the fence in it. How do you not spend all day long just walking around soaking it all in? I’d never get any work done. That ‘Northwind’ really is amazing, Alan. In the garden. 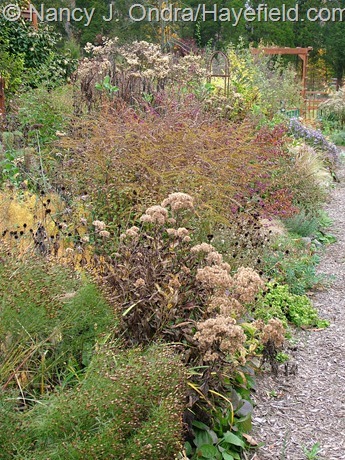 it eventually got a little sprawly (after 5 or 6 years), but out the the Long Border, I didn’t do any soil improvement, and the clumps are still very upright. I really did spend a lot of time taking pictures in the last week, but I don’t regret that now that everything is a soggy, brown mess. 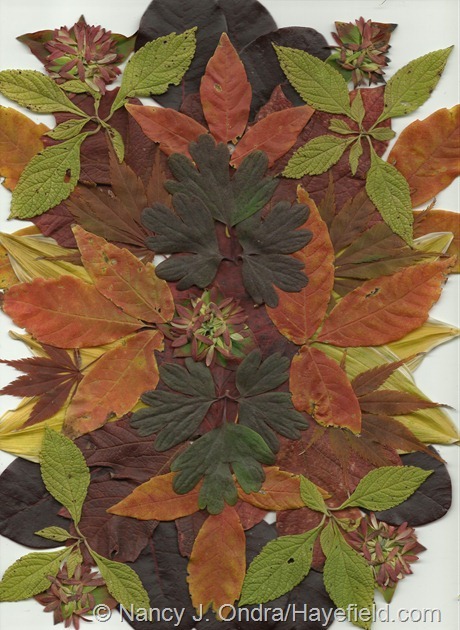 Your leaf collages (Plan B) are stunning. 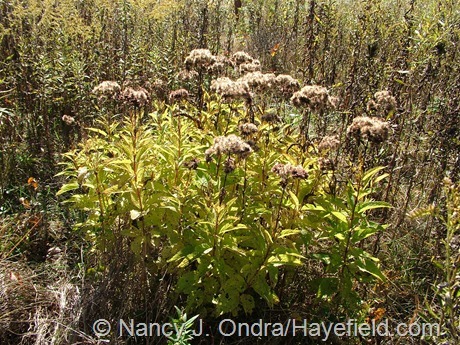 Is that Heptacodium miconioides at the corners and center of the second image? What a wonderful way to focus on color, texture and shape! Thanks, Alice – they were a lot of fun (except that…well…I didn’t take into account how much poison ivy leaves look like ordinary leaves when I was picking up pretty foliage off the ground). Heptacodium was a great guess for those rosettes in the second scan, but they’re actually the calyces of Abelia mosanensis. 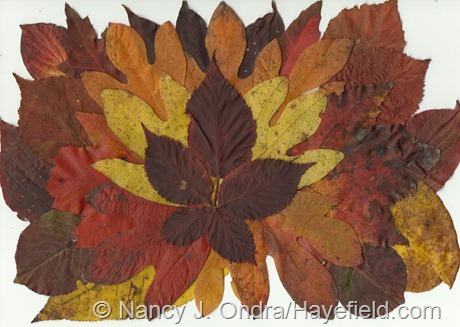 Nan, great post and creative display of fall leaves! Your were prepared for it all! I liked the shots of the garden overall. 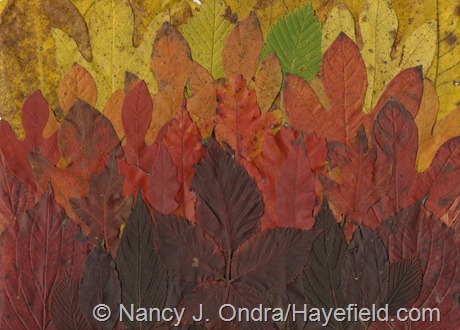 They showed the rhythm of the garden… The shots of the leaves looked like quilt panels to me! Very cool! I hope you fared well through the storm and that the garden was not entirely blown away. I’m glad you enjoyed the complete treatment, Kate. That was definitely the last color extravaganza of the season. The storm pretty much stripped off all of the leaves and berries, and since we didn’t have any power for a few days, I made a serious dent in my fall garden cleanup. The most amazing photo essay and blog ever – Thank you – you have brightened my day and given me a different perspective of this grey fall weather. Thank you so much, Kate. It sure would be nice to see some sunshine, wouldn’t it? It’s been well over a week here. I hope we all get to see some sun soon! 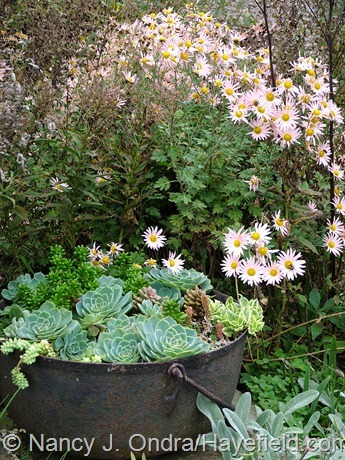 Your garden photo series was helpful and satisfying, as usual. 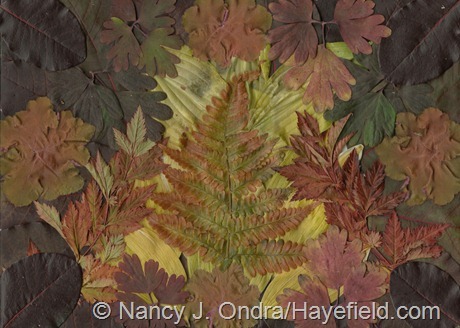 But what a joyfully creative series of leaf compositions, each getting richer as I scrolled through them! 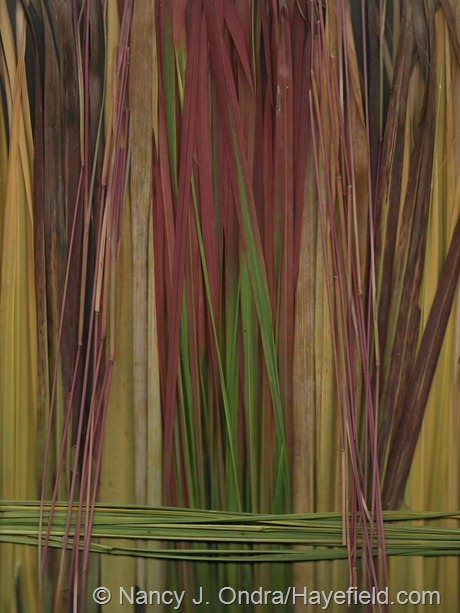 I especially loved the second image as well as the final one, plaid grasses. What an inspiring way to capture the spirit of the season. I’m sure you can keep going with more muted compositions in winter. Great stuff! I hope you and your garden made it through the storm all right, Eric. I’m so glad that you enjoyed the leaf scans. They were great fun to put together. I could have done several just with the sassafras leaves. I really liked how the grasses turned out too. As usually it’s another great post! You had plenty to share for fall color after all! The leaf displays at the end look great. 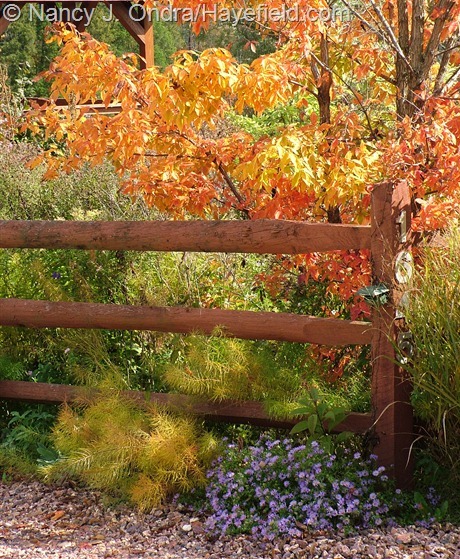 I have to say my favorite photo in this post is the fence with the maple and amsonia. The maple color and the flowing amsonia really work well together. 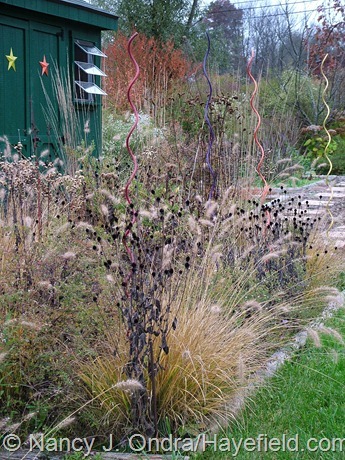 Of course I’m a big fan of the switchgrasses too! Thanks for joining in again this year to the Fall Color Project! 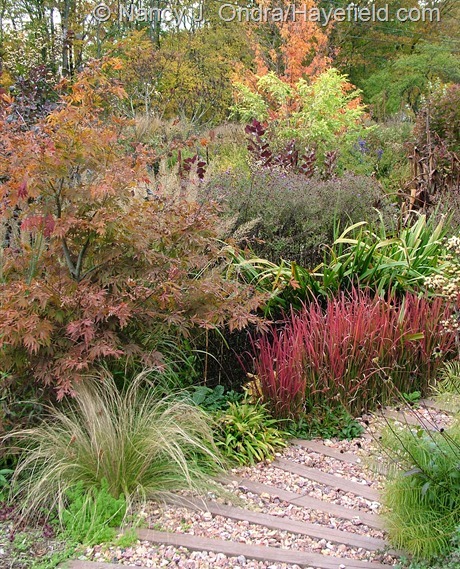 Thank *you* for giving us a great excuse to indulge in the many kinds of fall color, Dave. 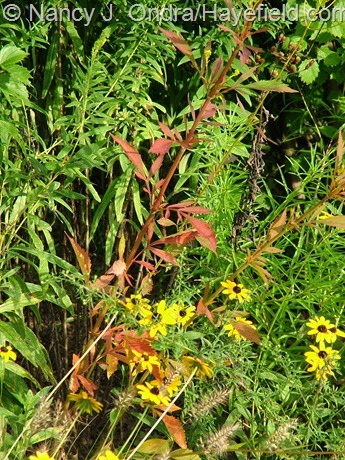 That combo of the maple, amsonia, and aster is one of my favorites, too. Nancy you are quite the gardener- so many beautiful plants with so much textural contrast. I know you are stretching the zones for some of them right? Thanks, Monica. We’ve already had a frost (well, a freeze) here a few weeks ago, so I think everything in these shots is dependably hardy here (mid-Zone 6). Nan, your Pseudocydonia is inspirational to me–how old is yours? 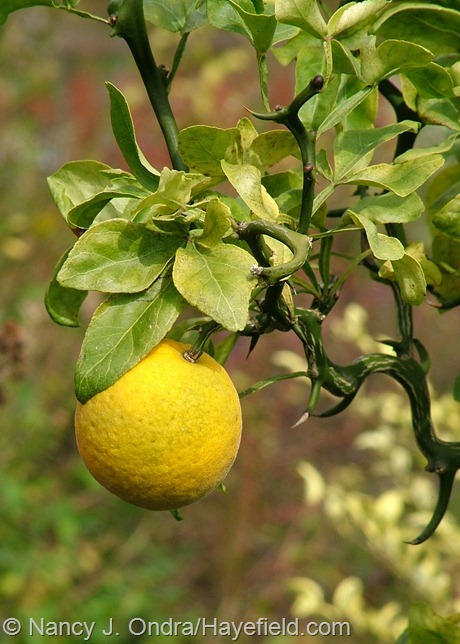 I have five of these, grown from seed–any idea as to when I can expect fruit? If I remember correctly, I started this one around 10 years ago. It started flowering 2 or 3 years ago, but this is the first year it set fruit. It’s not in an ideal spot, so that probably slowed it down a bit. Nan, I am in complete awe of your garden–absolutely stunning! I guess I shouldn’t be surprised, as I have a couple of your books and have read several others. 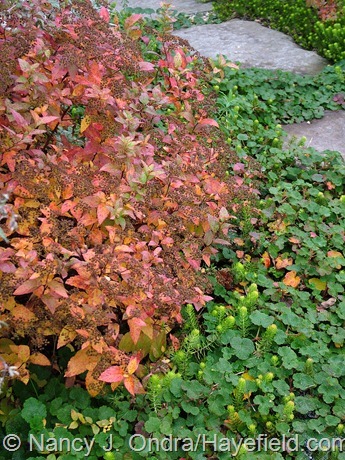 I love the spirea you’ve highlighted here; it certainly has the most eye-catching fall color of any spirea I’ve seen. 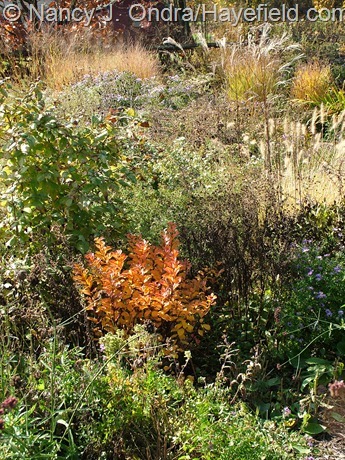 I’m going to bookmark this page and come back to it again for ideas for adding more fall color to my own garden–thanks for the inspiration! Welcome, Rose! Thanks ever so much for your lovely comments. 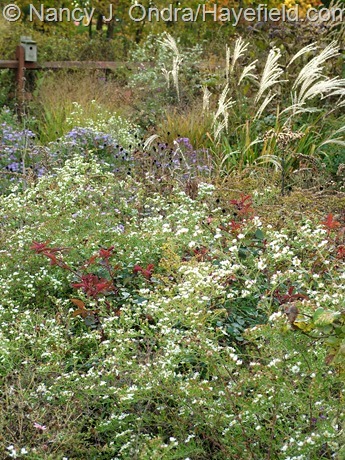 I’m delighted that the ‘Tor’ spirea caught your eye too. I really need to remember to take cuttings next year, because I’d love to have a lot more of it. 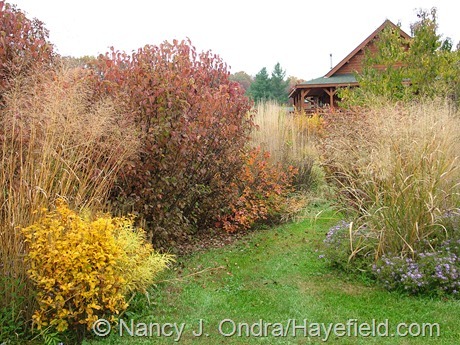 Nancy, despite your protests about this year’s fall foliage, I think you captured the colors at Hayefield beautifully. As for me south of you, here in Bucks I found this autumn on par with most, if not better on some tree species. And my yard is heavy on the trees! The first frost came earlier than it had in recent years (just before that average date), but only yesterday did we get that hard freeze that did in the colocasias and hardier annuals under my overhanging limbs (which were made pretty much bare after Sandy blew through). 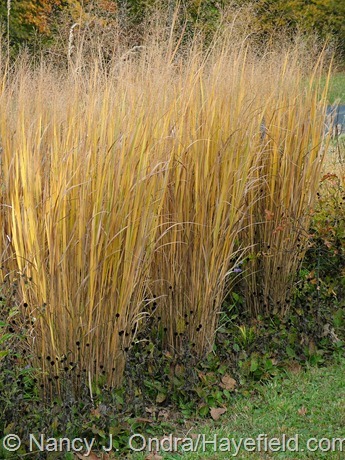 By the way, I, too, was taken with the uprightness of your Panicum ‘Northwind.’ I guess garden soils are often too rich a diet for so many grasses, making them floppers! Hi there, Bill! Thanks for the virtual visit. It’s great to hear that the colors were good down your way this fall. I could judge only by how things looked right around here, and we tend to be several degrees colder than where you are. 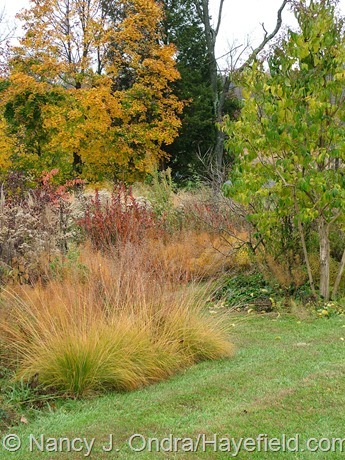 You’re right about the grasses: I’ve learned to save the well-prepared soil for plants that need it and keep the grasses (particularly the panicums and miscanthus) in the tougher sites. A wonderful tour of your garden, as always. Glad you’re okay after the storm. 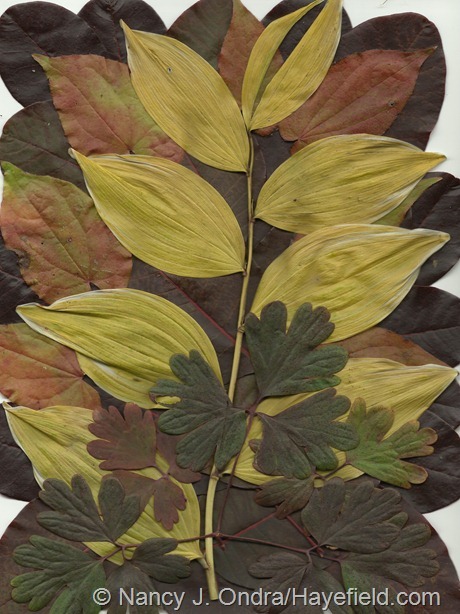 I’m curious about the leaf scans – do you just lay them out on the scanner? They are works of art. Hi Lyn! Yes, I placed the leaves directly on the glass of the scanner. The tricky part is trying to envision the finished piece since you have to build the layers upside down. I also learned to set a large, heavy book on top of the finished arrangement instead of closing the lid before scanning; otherwise, the pieces would often shift. Really, though, it’s pretty easy to do the scans, and they’re definitely a lot of fun to put together. Nan, I don’t think anybody comes close to you in designing for Autumn…every shot above is like something from a dream…so full of inspiration. I’m perpetually amazed how you manage to balance whimsy and sophistication so deftly. What a lovely thing to say, Scott. The plants never fail to surprise, as you know, but it seems as though they really outdid themselves this year! 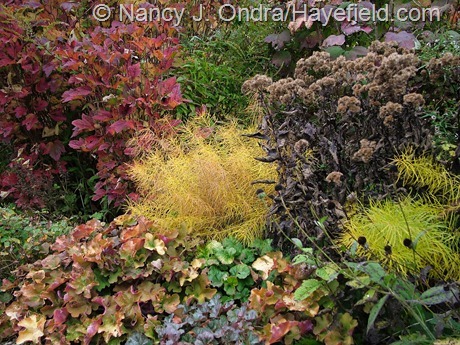 Reviewing these photos, Nancy, I realize your photography skills and selective eye play important roles in a presentation that shows your garden to be extraordinarily rich in textural contrasts with a broad palette of colors in the fall. 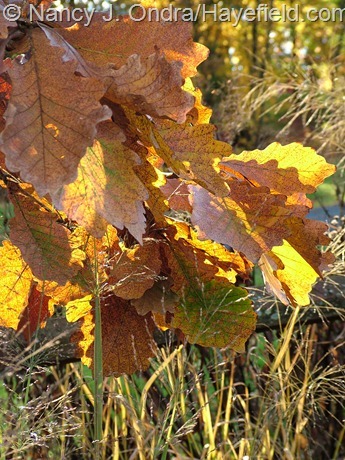 Can you tell us if you are clipping and eliminating a fair quantity of failing/dead foliage throughout your garden as you prepare for your photos? Or do you completely “boot out” certain plants from your garden that you consider to be detracting from the overall flavor each year? It’s a combination of the two, Eric. 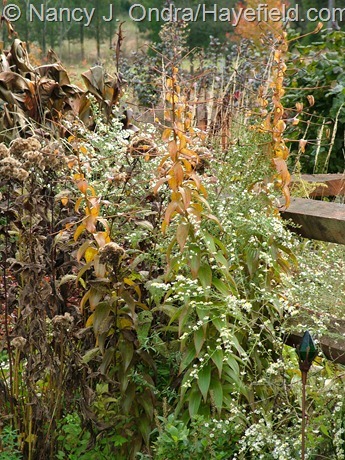 If a plant doesn’t offer something (nice foliage, late bloom, great seedheads, or whatever) from late summer on, then I move it elsewhere or don’t grow it again. What you’re really noticing, though, I think, is the result of ongoing editing to keep the plants looking tidy and nicely shaped, and to balance the colors. It used to be that I’d take photos and look at them days or weeks later, and then wish that I’d removed some dead leaves or trimmed something back a bit; by then, though, it was too late to shoot again. Now I tend to do the fine grooming as a routine part of my daily gardening time, then do a bit of fine-tuning if needed before I wander around with the camera. Working with the plants to make each one look its best is absolutely one of my favorite parts of gardening! 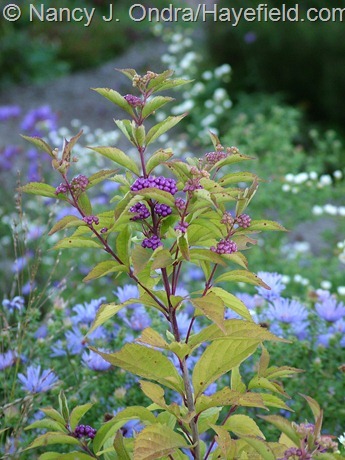 You know I think amsonia just might be tops. Two weeks after being yellow the rust catches midday sunlight and I swoon. Wow. Haven’t been by in a while, Nan, but glad I did. Lovely. If you want, come look at my last few posts to see how 5 years has bumped up the color, even in this massive, massive drought in Nebraska. Great to hear from you, Benjamin. 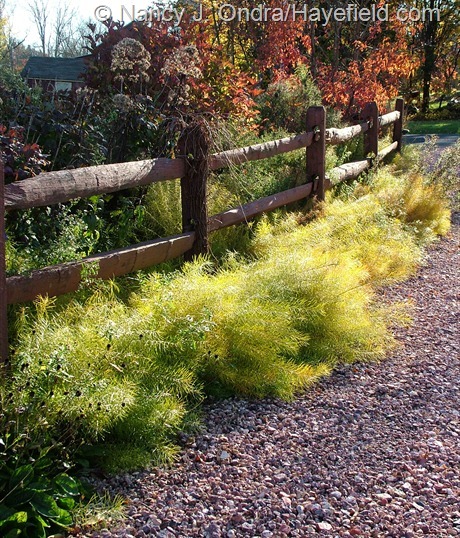 You’re so right about the dried amsonia color being just as good as the yellow. I’ll be over for a visit soon.